A perfect recipe for a quick lamb curry fix, which is also a very healthy Thermomix recipe. You can substitute the lamb for chicken or even throw it in the slow cooker with some beef. Served with creamy sweet potato mash or rice. This recipe is only available in The Healthy Mix Cookbook. This recipe is available in 'The Healthy Mix'. Buy Now. This gluten free, sugar free, dairy free recipe is flexible and has a number of different adaptations. yummy! so tasty and so easy. i only had about half of the lamb needed so added capsicum and carrots, very good! Wow! Just Wow. This lamb curry is an explosion of flavour in the mouth. I paired it with the ‘Indian Cauliflower Rice’ from ALToI, which was the perfect combination! 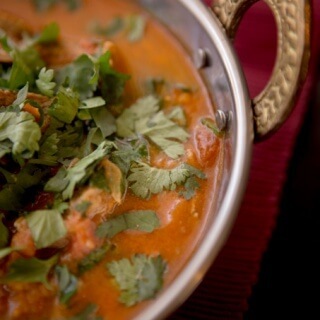 The curry is incredibly simple & fast to make, yet the freshness & depth of flavour it delivers is out of this world. The cauliflower rice also makes for healthy & lighter option. I’m relatively new to owning a TMX but now own all of Nik’s books, which I have cooked just about everything… but I think this Lamb Curry is definitely a new favourite 🙂 Thanks Nik! …. probably because cauliflower is so expensive. I’m eating this now for the first time and it is so delicious I had to stop mid chew and write a review. So simple and easy. I’m eating LCHF so I loaded it full of Chinese greens and a big blob of Greek yoghurt (and naturally lots of fresh corriander ). This is my new go to week night dinner. I’ve made it with Chickpeas and Sweet potato, chicken, beef and lamb now because it’s just so easy when I’ve forgotten to start dinner on time again. Thanks Nik! This really is a quick curry. Packed full of flavour as always. This is such a tasty and easy recipe. I had less lamb so added sweet potato to get up to 800gm in with the tomatoes.. Definitely make the cauliflower rice from ALToI, the flavour combinations are perfect. Definitely a hidden treasure in the new book!! Did I mention hibby and MIL licked their plates clean.